Safety culture transformation needs clear, strong leadership from all levels to achieve meaningful and sustainable results. Senior managers characteristically assume sponsorship roles and typically are the ones who sanction as well as provide financial and moral support for the change effort. Supervisors and managers live with the changes. 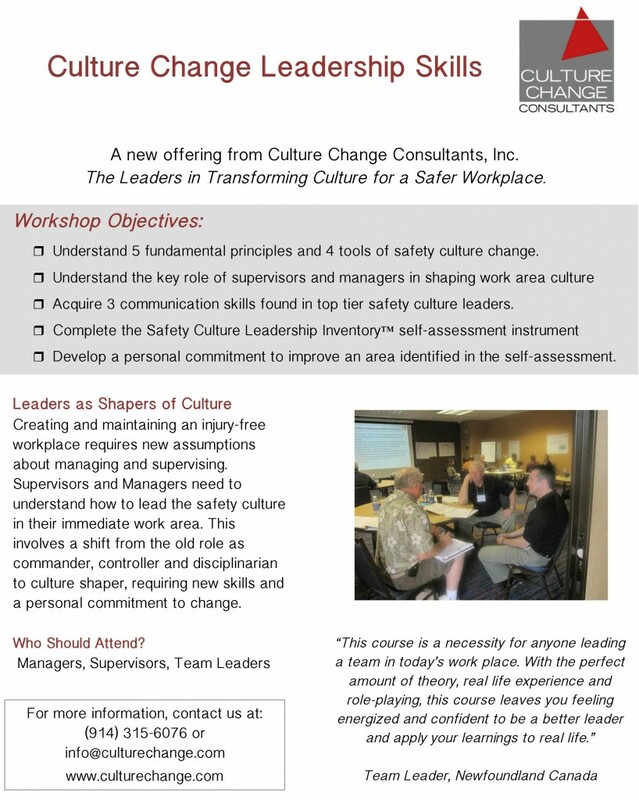 Culture Change Leadership Skills is a targeted intervention to provide supervisors and managers with the knowledge and skills they need to drive successful implementation of the Safety Culture Change Process. Getting clarity around the role of supervisors and managers as safety culture leaders often makes the difference between success or failure in developing a strong, positive safety culture. This course is conducted in-house with managers, supervisors and team leaders. It is not a public offering.